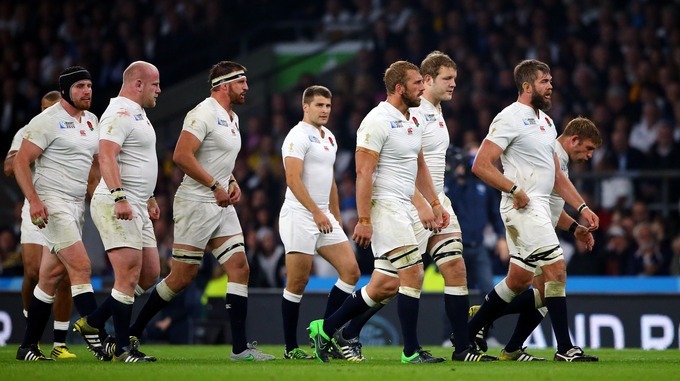 England are being portrayed as bad losers…by their own press. The Independent newspaper says the team is set to be “heavily fined” after players failed to show for interviews after getting smashed by Australia at Twickenham, a result which saw them dumped out of rugby World Cup contention. Only loose forward Tom Wood and reserve halfback Richard Wigglesworth showed up to “apologise to the nation” whereas each country is required to produce at least 10 players in the mixed zone for media interviews. Wood said the dressing room was in despair. They thought by hosting the game can go through a easy road since most of the match officials were on their side. They disgaced NZ haka, played dirty tactics and now what, they are out, not even at the quarter finals. Fiji showed them on their first game how the games is played. Very embarrassing of them to be bout of the early stages of the game. U CHEATED ON FIJI…RIDICULE THE NZ HAKA WHICH IS PARAMOUNT TO OUR NZ NATIVE FAMILY & FOREMOST CHEATED ON THE 2015 WORLD CUP DRAWS…& GUESS WHAT?? ?…U WON THE 2015 RUGBY WORLD CUP!! !